Product description: The SimpleStrip Skimmer Tool is a revolutionary 8" wide wallpaper scraper. 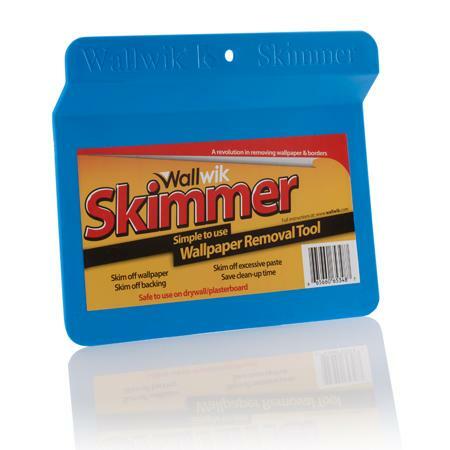 The Wallwik skimmer is excellent at removing wallpaper, backing, or paste. The flexible plastic tool will not gouge drywall like a metal scraper, and will save clean-up time by removing the wallpaper in large pieces. The Skimmer allows downward force against the drywall, to skim unwanted material off the surface. Once the wallpaper or backing has been removed, the Skimmer can also be used to remove excess paste residues, which is essential before redecorating. Simply spray the wall again, wait for 5 minutes and then use the Skimmer to remove the paste. Multi-purpose Skimmer tool can also be used for clearing snow and ice from car windshields.